Mayor Bill de Blasio has hinted that his administration will change the admissions procedures sometime in the future—not this year—at the five specialized high schools established during the Bloomberg administration, which are not governed by state law: Brooklyn Latin; High School of American Studies at Lehman College; High School for Math, Science and Engineering at City College; Queens High School for the Sciences at York College; and Staten Island Tech. The changes would address concerns that declining numbers of black and Latino students are accepted at the elite specialized schools that use the Specialized High School Admissions Test (SHSAT) as the sole criterion for admission. No changes are planned for this year, and the SHSAT given on Oct. 25 and 26 will be basically the same as it's always been. Even in the future, it's not likely that the SHSAT will be eliminated for the three older, exam-based specialized schools—Stuyvesant, Brooklyn Tech and Bronx Science—because that would require action in Albany. Some legislators have introduced bills to change the 1971 law that establishes the exam as the only admission criterion for these three schools, but the chance of passage appears slim. However, it looks likely that the test itself will change. 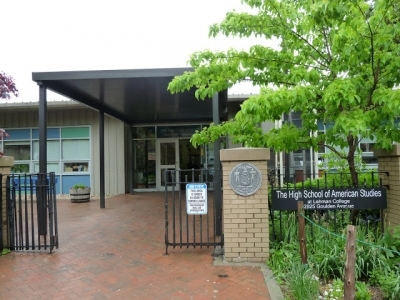 The city's Department of Education has issued arequest for proposals "to provide a standardized testing program which is designed to select students for admission into the specialized high schools." The new test would come into effect in 2015 and proposals are due by Oct. 23, 2014. There is a pre-proposal conference on Sept.29, 2014, at 10:30 am at 131 Livingston Street, Room 610 in Brooklyn. The mayor has repeatedly said that specialized high school admissions should not be based solely on the test. The Daily Newsquoted him as saying officials are working on devising a new admissions system to replace the current one, at least for the five newer schools. "It's just this simple. This is a society that's supposed to be based on fairness. Our specialized schools don't reflect the kind of fairness that any New Yorker would recognize by any common sense measure," de Blasio said last week. Schools Chancellor Carmen Fariña told the Daily News that a committee of experts has been meeting to discuss what the new criteria should look like. "I believe in high standards, and we've got to be sure that whatever process we use, that the standards are still met," she said last week. Meanwhile, a number of groups have spoken out in support of test-based admissions, including alumni of the specialized schools. "Eliminating reliance on the SHSAT runs the risk of erasing what is different about the specialized schools and making them look like others in the system. We believe this is the wrong direction," Brooklyn Tech alumni wrote in a white paper. And in a statement in June, Bronx Science alumni defended the current admission process as "a pure meritocracy, with one standard that is transparent and incorruptible." In an interview a few days before de Blasio's comments, David Lee, a Brooklyn tech alumni who founded the Coalition Supporting NY Specialized High Schools, said his group would be against eliminating the test for any of the eight schools. "We wouldn't compromise on anything other than having the test," he said. The de Blasio administration may also take steps to help students from under-represented groups pass the SHSAT, possibly through DREAM, The Specialized High School Institute, a 22-month tutoring program designed to help economically disadvantaged students prepare for the test. Fariña has said that 48 percent of the middle school students who participated in DREAM were admitted to a specialized high school. There's also the possibility of expanding the Discovery Program, an initiative created by the legislature in 1971 that allows promising "disadvantaged" students who narrowly miss the cutoff score for admission to be accepted at a specialized high school after taking and passing a summer course. Bronx High School of Science and Stuyvesant abandoned their Discovery Programs in the early 2000s, although Brooklyn Tech and Brooklyn Latin have continued to admit students this way. Of students admitted to the exam-based specialized schools for 2014, 5 percent are black, 7 percent are Hispanic and 53 percent are Asian. In the school system as a whole, 28 percent of students are black, 40 percent Latino and 15 percent are Asian. Many who support the existing system point out that a high percentage of students admitted to the schools are poor enough to qualify for free and reduced lunch. In 2012, NAACP Legal Defense and Educational Fund filed a complaint with U.S Department of Education asserting that the test-only admissions policy was racially discriminating. The complaint is still being investigated.